How much does Apptimize cost ? The pricing for Apptimize starts at $995.0 per month. 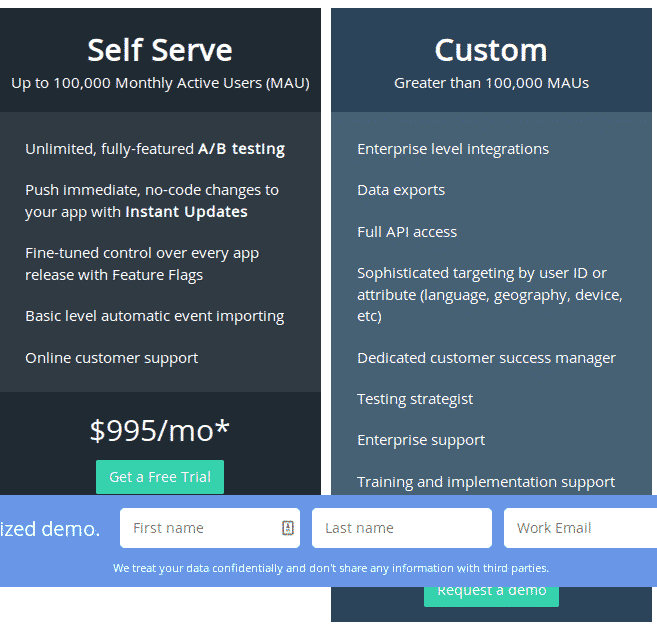 Apptimize has a single plan - Self Serve at $995.0 per month. Apptimize also offers a Free Plan with limited features. "Good & robust product, but high learning curve"
This product has been of great help, we have been able to accurately program several development options with our system. The WYSIWYG editor is very easy to use. Really well thought out in terms of A / B tests. There is a great learning curve to use this product, also specifically for developers. However, once you understand how the tool works, it becomes much easier to launch code block tests, or anything non-visual. Putting this away everything works perfectly. We improved the use of the WYSIWYG editor, and in turn we created a greater capacity for coupling with our department on the next floor. We take advantage of the A / B tests to expand our base server. 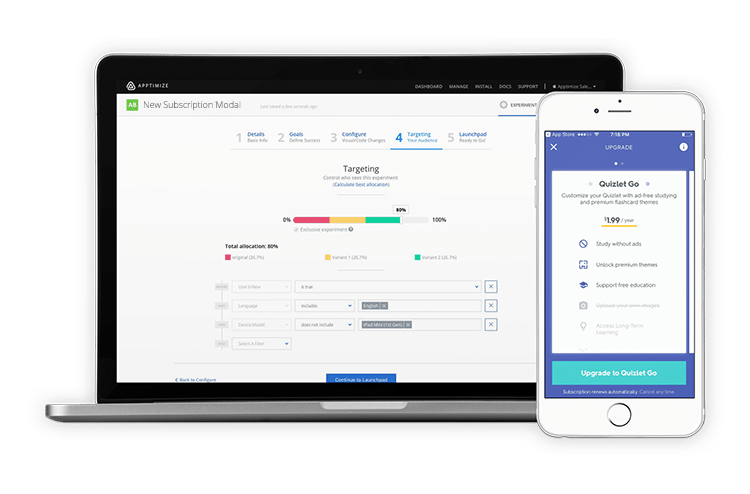 "I loved your A / B test design"
It allows testing very efficiently, Apptimize is an easy to use software, with a good interface and that has gradually become very helpful with its different tools. I just have not had problems with the use of Apptimize, I am satisfied with the features it has. We continue to improve our tools, the best of the market in terms of A / B tests. The fact it's native and so easy to manage makes it a must-have tool for our business. Probably the funnel analysis and views that we use to comprehend the data. Trying to increase conversion for our product. 1) setting up your own test success metrics and funnels. Apptimize allows developers to designate success metrics for each test and then provides the dashboard to make it easy to compare those metrics across variants. 3) Relationships. Apptimize invests in their customers, listens to our feedback and offers advice on our ab testing strategy. It's important to monitor your app performance after implementing Apptimize. A/B testing and feature rollout on native mobile apps. 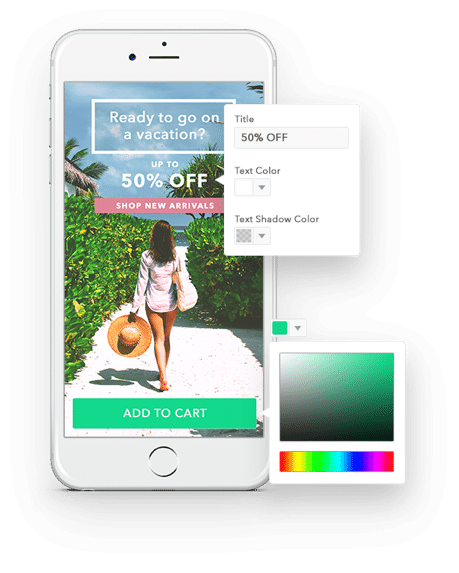 "A great mobile testing tool supported by a knowledgeable product team"
Apptimize has many great functions including a reliable visual testing tool and a powerful programmatic editor with which you can build many testing driven product decisions. There isn't much to dislike about the platform. I'm looking forward to the many amazing features to come. 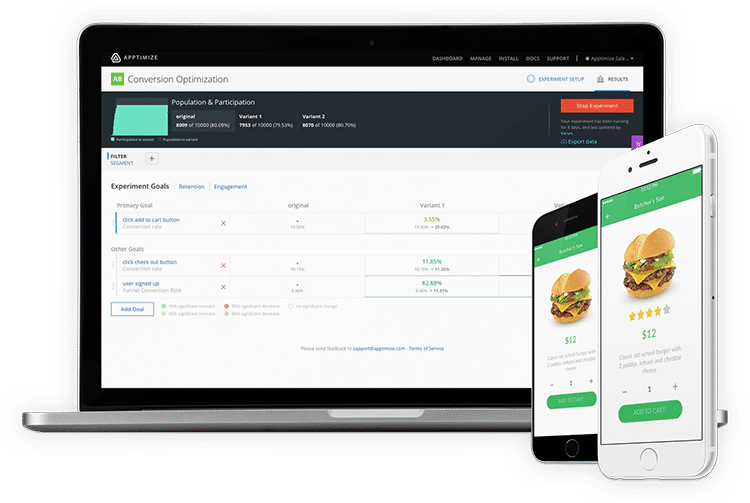 I would consider Apptimize for anyone who is interested in making data and testing driven decisions in their product development or acquisition roadmaps. 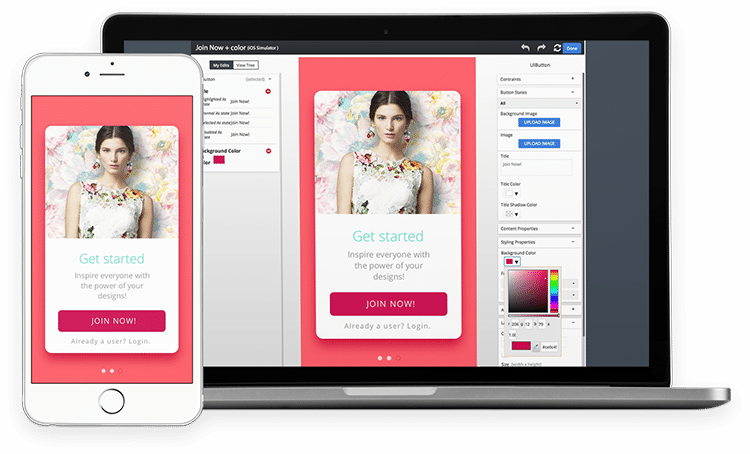 Apptimize is unique in the sense that it allows you to build small visual experiments on things such as buttons, colors, or images or large experiments on the usefulness of entire new modules or user flows. We're looking to increase the number of subscriptions purchased in the app, increase the tenure of our already existing subscribers, and improving many in-app experiences and products. We also have used apptimize to test push notifications in order to increase the percentage of users who are opted in. "Apptimize offers great service while giving you what you need in A/B testing"
I like the responsiveness and the quality of support. Questions are addressed in timely manner, and the Apptimize team genuinely want to see us to realize the benefits of A/B testing. The service team actually performed tests for us to show what kind of benefit we could be seeing. Integration with m-particle is limited. Ability to map user based actions to user behaviors is somewhat limited. User interface has been buggy. The startup cost outweighs the usage, want a full service solution, I don't want to have to admin the campaigns, just want to see results for the service we pay for. We have found just by switching the text on a few buttons and fields we were able to dramatically change user behavior. "Very friendly for a non-tech staff member"
Ease of use. Apptimize makes it easy for a non-technical staff member to run tests. The layout of the experiments can be confusing. A/B testing quickly and instant updates when in a pinch. I don’t think there’s a lot to dislike in Apptimize. One thing that I would love in the product is a web testing platform. Go for it if you are looking for a tool that caters to your mobile AB testing requirements. Using this product, I am trying to improve KPIs like conversion rate, usage, and retention. "Works, but too much magic"
In most of the cases when it doesn't work there is no way to find out why. Documentation is not intuitive. Nice product, but sometimes hard to fix problems.